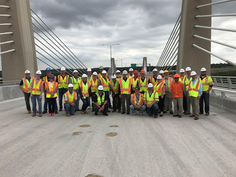 On June 29, a group of 30 Chapter members (and a few friends) had the unique opportunity for one last up close and personal look at the brand new, about-to-open St. Croix Crossing project. Construction of this magnificent bridge began in 2013 and is nearly completed, with the opening set to take place in early August. Our outstanding hosts from MnDOT, Tom Villar and Juan Podesta, guided tour participants along an exciting journey of exploration that took us along the deck surface, below the deck on a catwalk that hangs about 100 feet above the St. Croix River, into the cavernous interior of the precast box-girder components, and high above it all at the top of one of the pier towers for an unmatched view of the project and the scenic river valley. The project will connect Oak Park Heights, Minnesota with St. Joseph, Wisconsin and has an estimated cost of approximately $400 million for the main span sections. The project involved a high number of shareholders and required approval on the national level to begin work, requiring legislation sponsored by Minnesota Senators Klobuchar and Franken that ultimately culminated in approval by President Obama. With an extradosed design, the bridge combines the long-span and slimmer deck feature of a cable stayed bridge, with the lower profile of a concrete box-girder, allowing the pier towers to be shorter and less intrusive to the river valley. As Minnesota’s next major infrastructure icon, it will be the 2nd bridge of its kind in all of the United States. After the cruise, much of the group hung out for a fun social hour debriefing on the back patio of the Lion’s Tavern in beautiful Downtown Stillwater. It was an afternoon unforgettable experiences! The Bridge and its approach ramps contains about 1,000 precast box segments, with each of the 650 precast segments of the main spans weighing in at roughly 180 tons! The design of the pier below the deck was chosen to minimize the visual mass of the structure near the river surface, and its form was patterned after a reed. Each of the cross-beams that connect the northerly and southerly piers contains over 478,000 pounds of epoxy-coated steel reinforcement bars, and over 130 truckloads of concrete! Eight stay cables connect to each side of each pier tower. Each pier location on the river will have 32 total stay cables (for a total length of 5.2 miles). Each stay cable is comprised of 76 individual strands – adding the lengths of all the strands in the bridge would stretch for 400 miles! Each cable has a total stressing force of 2.5 million pounds - for a total capacity of 80 million pounds per pier! For more photos, visit the Photo Gallery.